When Philip Deignan first threw his leg over a mountain bike 21 years ago, to take part in a charity cycle from his hometown of Letterkenny to Sligo, the then 14-year-old was blissfully unaware of just how far a bike could take him. An Olympic Games in Beijing, seven starts in the Giro d'Italia, five in the Vuelta a Espana - including a famous stage win into Avila in 2009 - are some of the highlights of a 14-year career that came to a close last week. "Back then, I never dreamt I could get to where I got to," admitted the affable Donegal man yesterday. "I was just enjoying my bike as a young kid. It was a bit of an adventure. Even when I went to Dublin to watch the start of the Tour de France in 2008, being a professional rider seemed like an impossible task. "I never sat down and said I wanted to be a pro bike rider. I was just happy to see how far I could go. If I wasn't good enough then I wasn't good enough, but I made it somehow." A stellar amateur career saw Deignan's talents as a climber so sought after that top French team Ag2r offered him a three-year contract in 2005 - a year longer than usually given to neo-pros. Victory in the 2005 Tour de Doubs though was the only mark Deignan made in those three years and by the Beijing Olympics in 2008, he was ready to pack it all in and go home. "It could have all ended there and then," he admits. "I was still mentally scarred from riding the Giro that year. "In those first few years, I was doing everything wrong in terms of diet and training but it was just impossible to compete in those days anyway. "I felt like I was banging my head against the wall really. That first period in my career, I think I massively underestimated the doping problem. I was quite naive to the scale of it really. "Looking back now, from 2005 to 2008 was a pretty bad time for the sport, I mean there's been other bad times as well, but personally I found that particular period very difficult. I was fed up getting my head kicked in all the time. "As a neo-pro you're expected to get your head kicked in to some extent, especially when you're riding the bigger races, but I'd be lining up for races knowing it was just about hanging on and getting to the finish. I was a climber, but here I was finishing in the grupetto every day. Like I said, I definitely wasn't training or eating right, but it was pretty impossible to get results as a climber or a GC rider in that period. I was ready to stop altogether and go back to college." Friends and members of the Irish cycling fraternity convinced him to stick it out for another year however and Deignan moved to the Cervelo test team in 2009. By the end of the season he had become the first Irishman in 17 years to pull off a Grand Tour stage win. Although illness, injury and circumstance combined to see that he never quite reached those dizzy heights again, Deignan tasted overall victory at the 2013 Tour of the Gila in America and carved out a solid career riding in the service of others on the world's toughest mountain slopes. "The Vuelta win really stands out as a highlight for obvious reasons," he says. 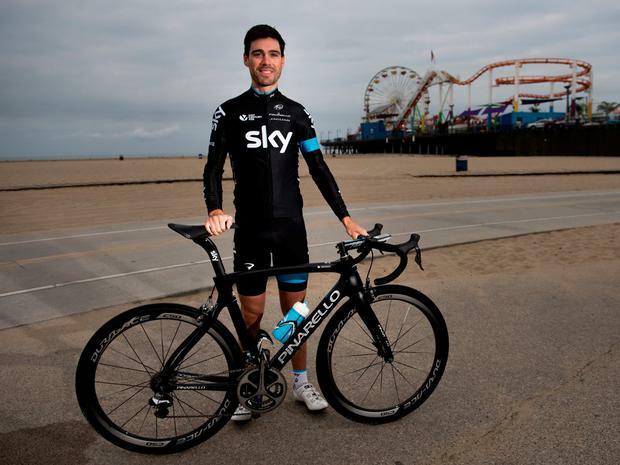 "In my first year with Sky (2014) I had a good run at the Giro, came close to stage wins a couple of times in the last week, went to the Vuelta at the end of the year with (Chris) Froomey. He finished second and I had a really strong three weeks supporting him. "They're the type of performances I look back on. To ride the Giro when it started in Belfast was an incredible experience. To have a couple of bus loads of friends and relations from Donegal come to see me ride a Grand Tour on home roads was once in a lifetime stuff. "I think if you asked every rider at the end of their career they'd all find some regrets too. Sky were definitely on one end of the spectrum compared to Ag2r, where I was left to my own devices as a young rider as regards training and nutrition." Ironically, it was the latter that probably cracked him in the end. "Sky were so regimented, the way training and lifestyle was controlled that it sort of made the bike a bit less fun the last few years, but that's just progress and the way sport has gone. "With altitude camps and other training camps throughout the season, I'd come home after a race and just be relieved to get away from it all, but then pretty soon you're off to a training camp again. That got to me a bit the last couple of years. I wasn't able to switch off after a race because we were back into it again." Deignan's career decision to ride for good teams for a good salary rather than be a big fish on a smaller team meant he missed out on a Tour de France start and often on places in other big races. "It was a very frustrating season this year", admits Deignan. "The whole spring was targeted towards the Giro in May. Things were going alright, but I just missed out on selection. I can't really complain about it because there were 14 riders going for eight spots. But it was the way it was handled from the Giro onwards. "After I found out I wouldn't be doing the Giro, I had no idea what races I was doing. I'd nothing to refocus on and build towards so I was riding around a bit aimlessly and only raced sporadically for the rest of the year. "To be honest, I felt like I didn't get a chance to show myself at all this year. I'd get a phone call to say I might do this or that and I found it very difficult to focus when I didn't even know what I was training for. " Still, the decision to stop was somewhat unexpected, even if was made a little bit easier after Deignan and his wife Lizzie - herself a former world road race champion with Great Britain - welcomed the birth of daughter Orla during the summer. "Initially, I planned to keep going for another year or two but I didn't have a set date or an age in mind. It was more about if I was still enjoying it and if I was still getting well paid, but I'd say I started thinking more and more about retirement after August and the arrival of Orla made the decision a bit easier." He is already convinced the decision to stop is the right one. With Lizzie focussed on Tokyo 2020, the couple have already had a hectic few months. "We had a creche and a part-time nanny arranged but it's only in the last two months I realised how hard it would have been to keep racing. We would have had to compromise so much with training - because you're not going to compromise your child. It would have been cycling that suffered," he admitted. They will stay in Monaco until Lizzie stops racing, probably at the end of 2020 before relocating to Yorkshire, although summer trips to Donegal will feature regularly and bike rides still feature in his daily routine. "I still go out on the bike a few times a week for an hour and a half or so and do a bit of running, but there's lots of things I won't miss about cycling. I really don't miss waking up exhausted and having to do five hour rides - the constant tiredness that goes along with being a bike rider. If I wake up exhausted now it's through lack of sleep." With a Vuelta stage winning father and a world champion mother, little Orla's first pedal strokes will be much anticipated, but will she declare for Ireland or Great Britain? "It might be a question of who comes to her first," laughs the proud father. "I'll leave that to Andrew McQuaid to manage."